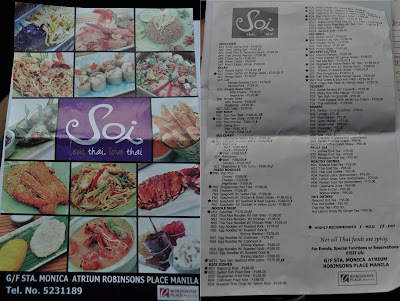 Went to Robinson's Place Ermita recently and this new Thai resto called Soi caught our attention. One of their staff was giving away flyers with their menu on the back to passers-by and so we got ourselves one. The pictures on the flyer was very enticing that we wanted to try them all. Checking their prices, it was affordable and reasonably priced so we asked for a table for two. I love the purple concept of the restaurant giving it an elegant touch and royalty feeling. Thai sculptures and frames could be found on the shelves near the kitchen with photos of elephants and Thai goddesses. The tofu were crispy on the outside and soft on the inside with tamarind sauce drizzled all over it topped with some fried onions and nuts. A small cup of more tamarind sauce came together with the dish. I find the texture of the tofu quite grainy and mushy at the same time but the tamarind sauce compensated for its texture because I loved the sweet and tangy taste of the sauce. I still prefer Thai Dara's Crispy Tofu though. The Bagoong rice was well presented with different ingredients circled around it. It has small hebi (dried shrimps) pieces, salted egg, pork bits, shredded mangoes, red and green chili, slice of cucumber and lime, and shredded eggs atop the rice. We did not like their Bagoong rice because you can't actually taste the Bagoong in it. I love those Bagoong rice that you can eat without anything else. For this one, a dish to go along with it is a must. Their Vegetarian Pad Thai was dry making the noodles stick together upon getting myself a serving. Taste was ok but there's a need for improvement. I had to squeeze in some of the lime to add up a little more flavor and taste. 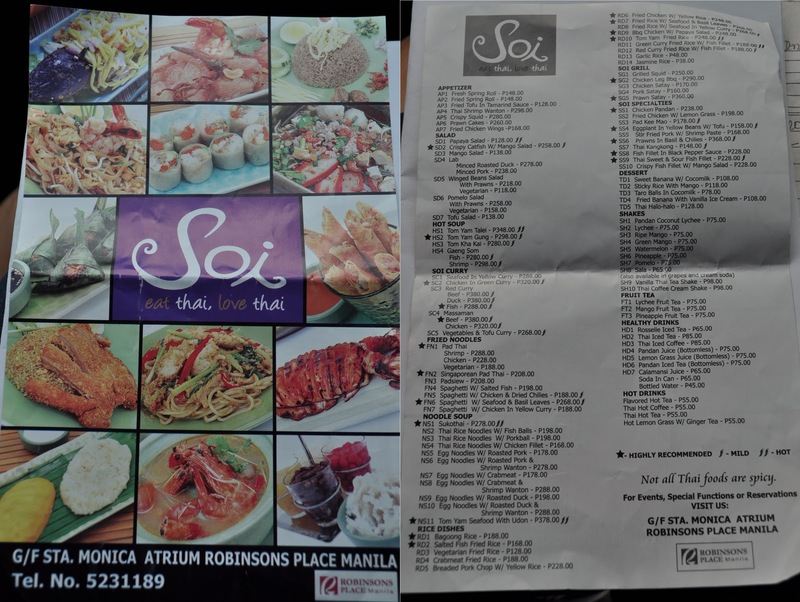 Soi- Eat Thai. Love Thai. Pedro Gil, cor. Adriatico Sts. doesnt look that yummy nga. Sayang, the bagoong rice looked enticing on the photo. Sad that it doesn't have a strong bagoong flavor.